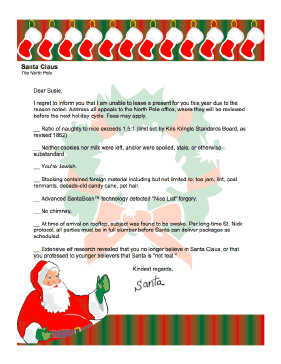 This funny letter from Santa Claus, for adults or older children only, is a checklist of reasons why Santa won't be bringing any presents this year. I regret to inform you that I am unable to leave a present for you this year due to the reason noted. Address all appeals to the North Pole office, where they will be reviewed before the next holiday cycle. Fees may apply. __ Neither cookies nor milk were left, and/or were spoiled, stale, or otherwise substandard. __ Stocking contained foreign material including but not limited to: toe jam, lint, coal remnants, decade-old candy cane, pet hair. __ Advanced SantaScan™ technology detected "Nice List" forgery. __ At time of arrival on rooftop, subject was found to be awake. Per long-time St. Nick protocol, all parties must be in full slumber before Santa can deliver packages as scheduled. __ Extensive elf research revealed that you no longer believe in Santa Claus, or that you professed to younger believers that Santa is "not real."